In New Haven, you never know how the weather will affect your daily routine. As fall turns to winter, rain can quickly transition to ice or snow and make slippery surfaces very difficult to navigate. 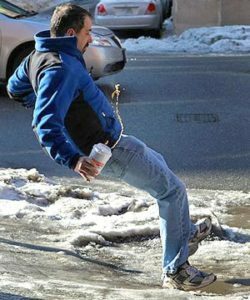 Sometimes, no matter how careful you are, a small patch of ice or snow can put you at risk of a significant New Haven personal injury. These injuries are often preventable and in some cases can be due to negligence of a home or business owner. The law protects you from this negligence. Provided the home or business owner has had a reasonable amount of time, following a snow or ice storm, they must clear any walkways on their property after a winter storm has ended. The owner is afforded a reasonable amount of time to clear the property of treacherous conditions. If you believe your slip and fall accident happened after a reasonable amount of time has passed after the end of a winter storm, the home or business owner may be liable for your injuries. Contact our New Haven personal injury lawyers to discuss your options.